Heat networks have huge potential to help address fuel poverty and contribute towards the UK’s Climate Change targets. As such, they have received considerable Government support in recent years, mainly aimed at encouraging the installation of new networks through the Heat Networks Delivery Unit (HNDU). However, many existing installations remain dormant or are performing suboptimally, with experiences of antiquated or poorly-designed systems undermining networks’ reputation for reliable, low carbon, cost-effective and comfortable heat. The Energy and Climate Change Committee (2016) has also stated that the UK is not yet halfway towards its 2020 targets of achieving 12% heat from renewable energy, and this is unlikely to be achieved through the installation of new system alone. Greater focus on existing heat networks is required in order enable operation and increase optimisation. Installation of capital-intensive technologies is commonly seen as a panacea for major energy savings by organisations. But all too often the technologies fail to live up to design aspirations in delivering the level of performance and savings anticipated. This is particularly true for heat networks; across the country countless biomass boilers and combined heat and power (CHP) facilities are mothballed or infrequently operated. The reason is less about the technology, but instead a combination of issues including but not limited to; poor sizing, installation, commissioning and FMs inadequate understanding of the technology. These issues cut across the industry, leaving the end-user struggling with new kit and the technology receiving a bad reputation. A significant level of work has been performed by professions to understand these issues on individual projects. However, learning outcomes have remained within their technical silos and not transferred across the various actors involved in delivering an effective heating system. The research will focus upon existing low carbon heat networks. CBx’s approach is to draw together expertise and live projects to develop a collaborative solution that builds upon existing research to overcome technical silos. It will also utilise new Heat Network (Metering and Billing) Regulations particularly for systems that serve more than one end user. Highlight examples of good practice where a heat network has been implemented successfully and running at its best efficiency. Identify cases where heat networks had been poorly implemented and subsequently fixed to offer best performance. Develop a user guide to help identify the drivers for technical silos and instigate the correct methodology to enable delivery. Members will attend a kick off meeting and then one meeting every quarter after that. Meetings with individuals will be necessary to talk specifically about data and to perform an assessment on case study low carbon heating technology. 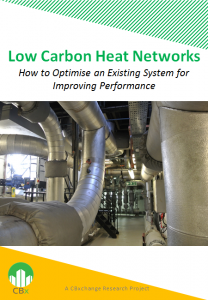 The CBx Research on Low Carbon Heat Networks investigates the barriers around existing heat network operation. Over the course of a year, CBx and the steering committee have provide case studies and held discussion with expert designers, developers, engineers, government, housing associations, and legal advisers, to provide an evidence base of current existing networks. Coupled with knowledge from existing industry research and standards, CBx has developed an evidence led guide to enable operation and optimisation of heat networks to achieve better performance. Please click the image below to access the final report. For more information on the launch event, please click here.